The biggest challenge for CIOs today, is the number of components that are needed to build a document management solution. They have to choose the right hardware, software and services from capture, classification and access controls for storage, to encryption, workflow and integration. CIOs run the risk of ending up with a fragmented solution that is too complex to maintain and difficult for end users to adopt. And with so many moving parts, data transfers and integrations may not meet changing security and compliance needs, leaving them susceptible to a potential data breach. Making it all fit seamlessly together is extremely important and finding a single provider who can do it all is no easy task. This is where Docufree stands out in addressing these challenges with one easy to adopt solution that is certified PCI DSS and HIPAA compliant. 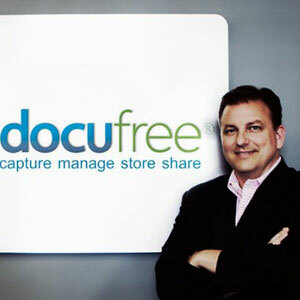 Docufree is a document management and business process automation company that helps organizations make paperless possible.“Our Path to Paperless solution combines document scanning, secure document cloud and digital mailroom services that allow organizations to get rid of their boxes, fire their file cabinets and stop paper at the source for good. It is an end-to-end document management strategy that has allowed our customers to maximize efficiencies, reduce costs and increase their compliance, “says Brad Jenkins, CEO, Docufree Corporation. “We stand apart by raising the bar with continued investment in our platform, providing our clients with a unified, reliable and secure method to capture and manage their documents,” adds Jenkins. Docufree’s platform is certified PCI DSS/HIPAA/HITECH compliant and the company undergoes annual SOC 2 Type II audits to ensure that they maintain the highest levels of security and disaster recovery in the document management industry. Jenkins says,“with a commitment to innovation, a winning attitude, passion for our clients and uncompromising integrity, Docufree delivers solutions that work and provide exceptional value to our customers.” PGA TOUR Superstore required a document management solution that would also integrate with their core systems. PGA TOUR chose Docufree Corporation who improved their workflow processes while reducing costs and paper usage. Docufree enabled the client to get immediate access to invoices, better management of payment terms and faster responses to auditors.“Docufree’s document indexing allows us to search using any information we have: an invoice number, a vendor name, or even a specific dollar amount,” comments Alison Hamilton, Director of Merchandise Accounting, PGA TOUR Superstore. With their newly launched Docufree Paperless HR solution, Docufree provides automatic capture, classification and upload of HR documents directly into ADP’s suite of HCM products. Provider of document management and business process automation solutions over a scalable platform without the high up-front costs and on-going maintenance, security and support issues that are involved with building one on your own.